Orientation and Angle: the optimal orientation is a South-facing roof, while the optimal roof angle is close to 90 degrees minus your latitude, which results in around 36-40 degrees for most of England. Orientation and angle have a big combined impact and can result in between 35% and 100% of optimal outputs. Shading: the level of shading during the day on the solar panels has a very significant impact; hence if possible all shading should be avoided. Light to medium shading can already reduce system outputs by up to 50%. CompareMySolar uses your own roof details of location, orientation, angle, level of shading and available roof size to estimate the outputs of potential systems from local installers. Please see below for a more detailed explanation of each of these factors. Besides the online tool we will qualify your roof further by discussing roof construction factors during our personal advice phone call. For example, solar panels cannot be fitted on old roofs that require replacement soon, or roofs of listed buildings. Solar PV system outputs depend on the location of your roof, as the level of solar irradiation varies. For a 1 kWp system this can mean a yearly output of between 675 kWh in the North and 975 kWh in the South of the UK (note: these numbers assume a solar system derate factor of 25%). 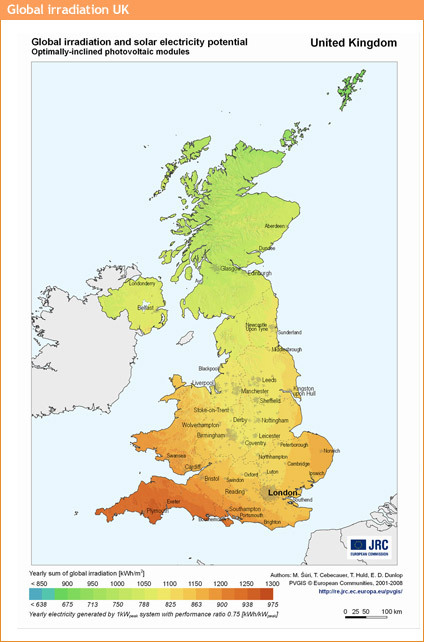 Roughly, Devon and Cornwall are the most attractive with over 900 kWh, while in most of England and Wales a 1 kWp system generates between 800-900 kWh. Scotland and Northern Ireland are less attractive with between 700 and 800 kWh. For the exact level of solar insulation at your location look at the map provided by PVGIS below. The legend shows the level of solar irradiation (in kWh per square meter) and the resulting system outputs of a 1 kWp system assuming a 25% derate factor. Orientation and angle are combined roof factors, as the having the right orientation becomes more important with a steeper roof angle. For example a flat roof would have no impact of orientation at all. The optimal orientation is a South-facing roof, although between South West and South East still provides close to optimal outputs. The ideal roof angle is close to 90 degrees minus your latitude, which results in around 36-40 degrees for most of England. Orientation and angle combined can result in anywhere between 35% and 100% of optimal electricity outputs. Please refer to the image below to estimate the impact of your own roof, where any outputs below 90% of optimal are not really preferred. The level of shading during the day on the solar panels has a very significant impact, hence where possible all shading should be avoided. Light to medium shading can reduce system outputs by up to 50%. Shading can occur at any time of the day and can be caused by buildings or trees but also by smaller objects like chimneys, pipes or even TV antennas. Even when a single cell within a solar panel is covered by for example a leaf it can have impact on the whole system. Shading at times before 9am or after 3pm has significantly less impact on system outputs than mid-day shading, so it is important to keep track of the movement of the sun in the sky during the day. Source: SAP 2009 standards as used in the UK shown in Table H4, page 63. The size of your roof sets the maximum boundaries of the possible solar system size (in kilo-watt peak) and hence limits your outputs. Mainstream solar panels generate an average of around 125 Wp per square meter. Hence for a 1 kWp system you will need around 8m2 of roof size. When you choose for lower efficiency (thin-film) panels that generate around 60 Wp per square meter you’ll need about 17m2. With more expensive high efficiency panels (generate around 180 Wp per square meter) a 1 kWp system can be fitted on around 5.5m2. Hence, your choice of the kind of panels to use strongly interacts with the available roof-space. See the previous chapter for a graph that demonstrates this. Using our system you can select the exact part of the roof you’d like to use for solar panels, and we only present solar PV system options from local installers that fit within these constraints.